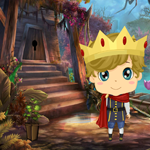 Games4King - G4K Cute Little Prince Rescue Escape is another point and click escape game developed by Games 4 King. In a beautiful forest, there was a mysterious mansion between dense trees. It was very intimidating to see. Cute little prince of the country is in that strange mansion. It is your duty to save the prince with all the clues in it. Good luck and have fun! Don't forget to click on some clues to see the rest of clue. Socks kinda face the wrong way. don't you have your special specs yet, bandy? And can't fool me this time on draging the lines! Thanks AO that had me stumped. These hearts are not very easy! Ao Is that the last puzzle? and dot clue not working for me?? Nice. Thanks for dragging tip...I never remember that!